Big Lake - A mellow 1-mile hike gets R.A.D. Campers to a beautiful black sand beach! This is where endless fun begins. 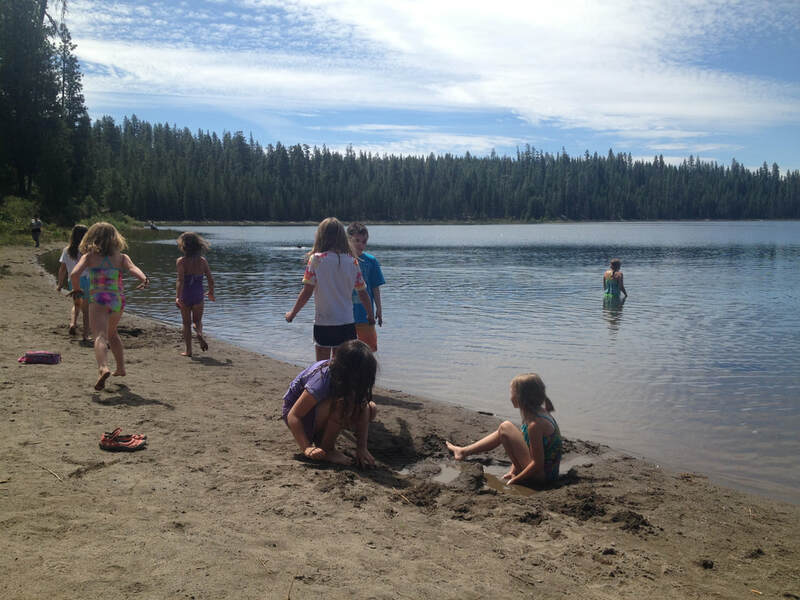 Who would have thought you could build sand castles at a mountain lake? You can here! 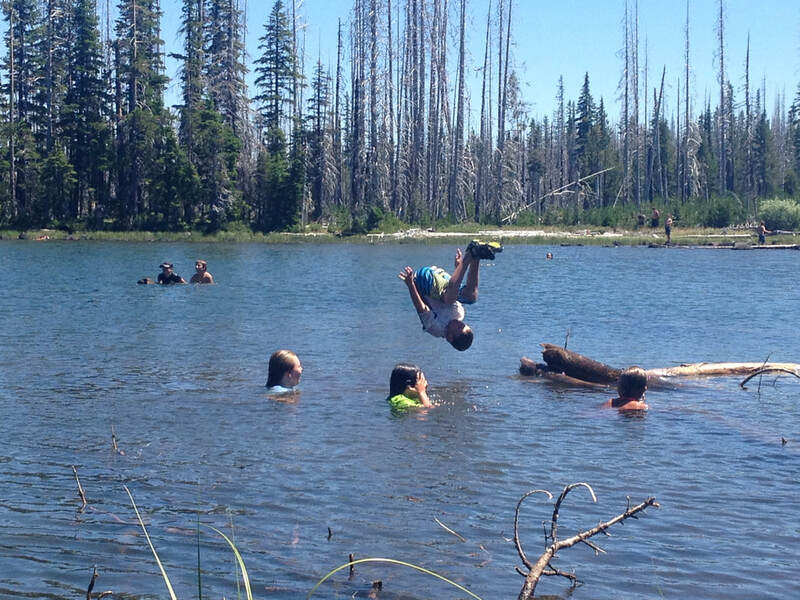 Kids can also swim in warm, shallow water, and explore the burned forest nearby. 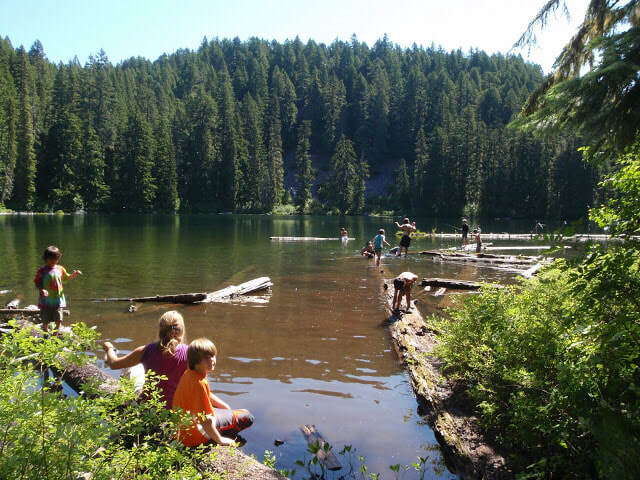 Bradley Lake - A quiet, hidden lake that has no trail leading to it offers kids a place to play games in the semi-logged forest and take occasional dips in the lake. Wild strawberries abound here! Nobody ever knows where this hidden gem is located, so it becomes our own personal lake all day long! R.A.D.! 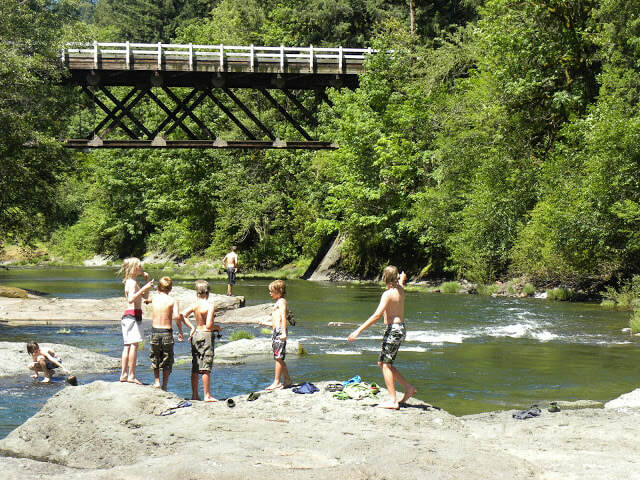 Cascadia State Park - This beautiful State Park is situated along the shore of the Santiam River. Though there is a short hike to a unique waterfall, kids prefer to hang out on the bedrock benches where numerous pools are located. This is a tough place to get kids to leave because of how much fun can be had! 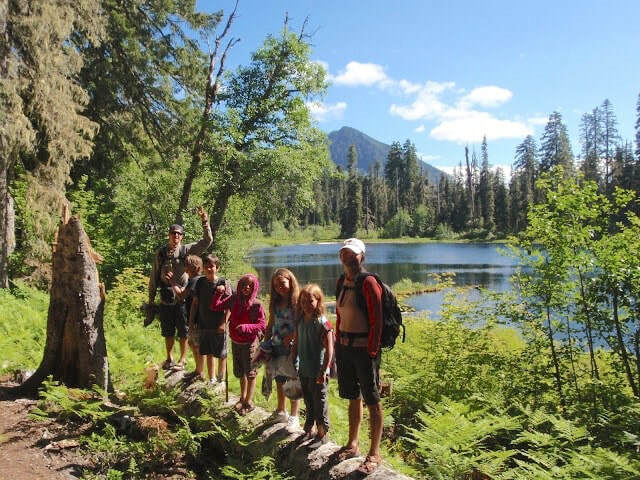 Charleton Lake - This adventure can lead the kids to a variety of activities, including exploring a rockslide, swimming to small, forested islands, playing games in the woods, and fishing for beautiful Brook Trout. You name it, this large lake has it! Clear Lake - A geologic oddity where lava dammed the McKenzie river 3000 years ago. 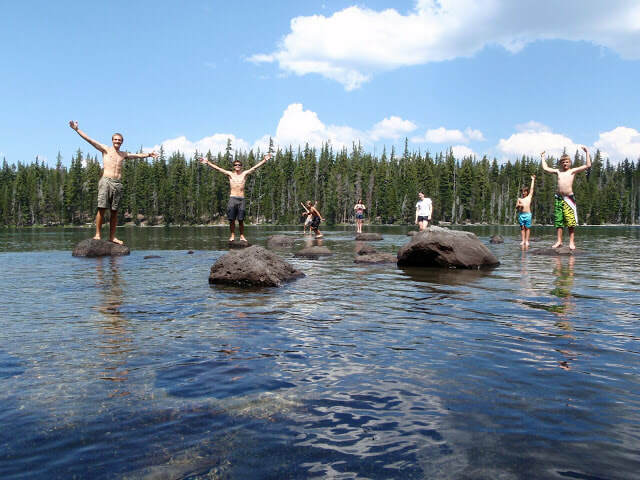 This crystal clear lake, with frigid waters, offers a two mile hike to the Great Spring where kids test their courage by jumping into the ice cold water. They can even spot the ancient submerged forest! This is the head waters of the McKenzie River. 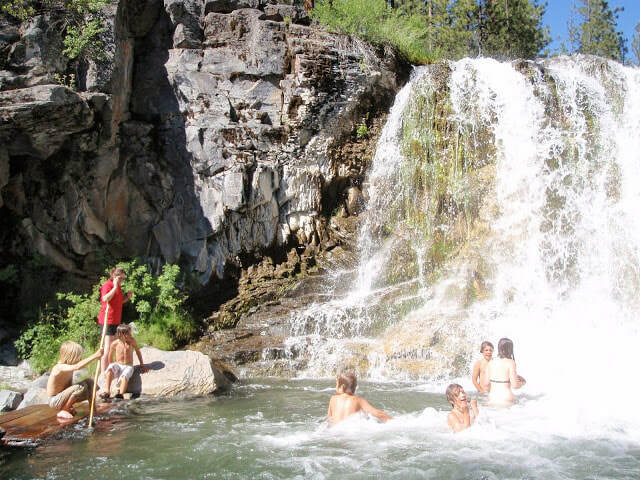 Cline Falls - An oasis in the dry desert, this State Park offers numerous small waterfalls and a great place for kids to explore the Deschutes River canyon. There is an abundance of wildlife that enjoy this canyon as well! A R.A.D. 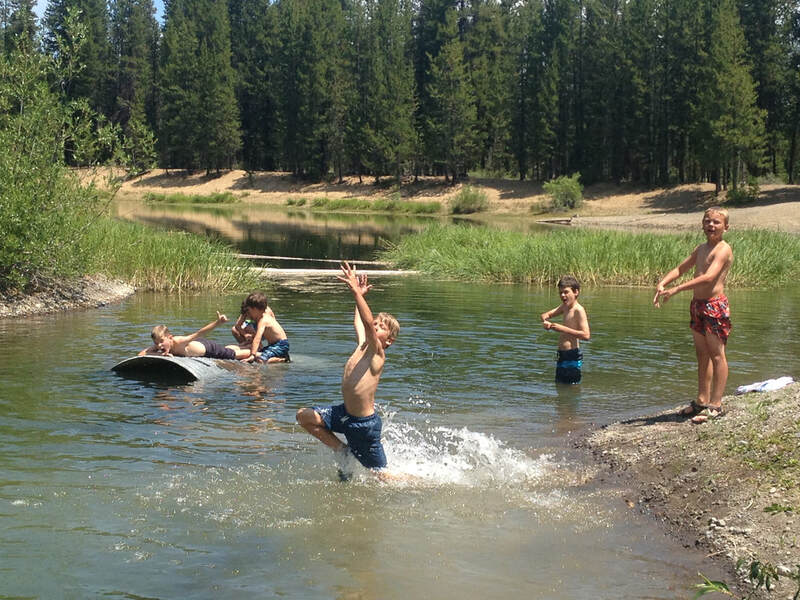 Campers favorite, with a day full of fun jumping and swimming off of a floating dock in temperate waters. 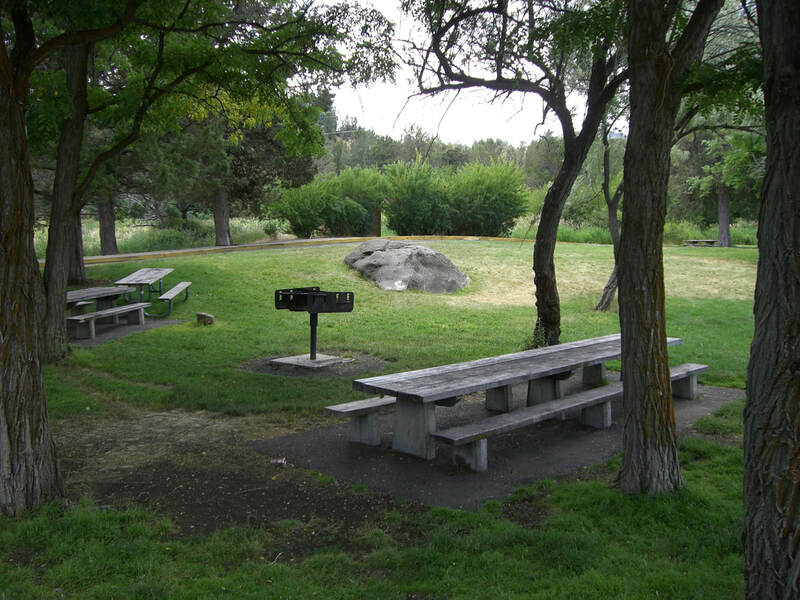 Then mix in some exploring around giant boulders on a grassy shoreline, and you have an unforgettable day at this State Park! Crane Prairie - A huge lake where kids generally play games in the forest around the rocks, but some bring a fishing rod and try their luck at catching a “Cranebow.” This place has bald eagles, osprey, snakes, frogs, lizards and more. Crescent Lake - A giant lake with plenty of options of what to do, but we like to go to Tandy Bay! Here, there is a fun rocky area in which to swim and play around. The kids stay right there all day and the time just flies. They could probably live there all summer if it was up to them! Daly Lake - A short hike through an old growth forest to a pristine high mountain lake with a beautiful creek flowing in and out of it. A short trail leads its way around the lake offering plenty of time to play games and run around in the forest. Maybe even swim off a log in the chilly waters! Davis Lake - Known for its fly fishing, this large and beautiful high mountain lake has a lava flow at one end that kids love exploring. This is where Odell Creek is dammed by the lava flow, creating a unique ecosystem. Lots of exploration and fun to be had here! 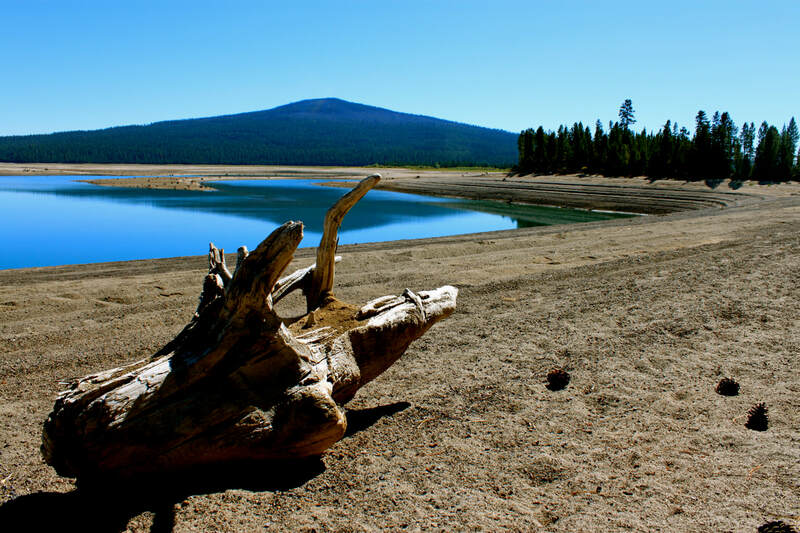 Deschutes River Headwaters - The group will take a look at the headwaters of the Deschutes River, where it still looks like a small mountain stream. Then we explore our way downstream looking for fish, bald eagles, osprey, and other creatures. Devils Lake - This oddly colored lake offers numerous opportunities for exploration that most visitors don’t even know about! These include hidden springs and fun lava flows. Adventure, swimming, games, and more are what this day is all about! East Lake - This gigantic lake is truly R.A.D. The lake sports one of the best beaches around, and it has open timber surrounding it, in which it is great to play games and explore. Some kids bring fishing poles and try to catch some of the gigantic fish that call this lake home. Also, sometimes we go find the “secret” hot springs! Echo Basin - This relatively unknown basin is packed with scenic beauty and an over abundance of wildflowers! 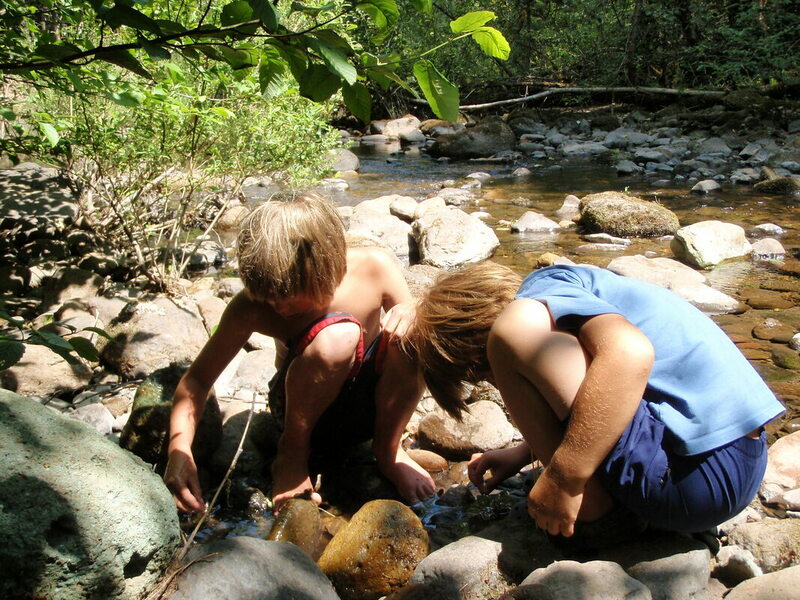 It is about a 2.5-mile loop hike where kids have an opportunity to explore a creek within the old growth forest, play games, and let their imaginations run wild! Fall River - Another spring-fed river that just comes to life from underground in the middle of a forest! Once again, a tranquil oasis in the high desert and a locals' favorite place for fly fishing. R.A.D. 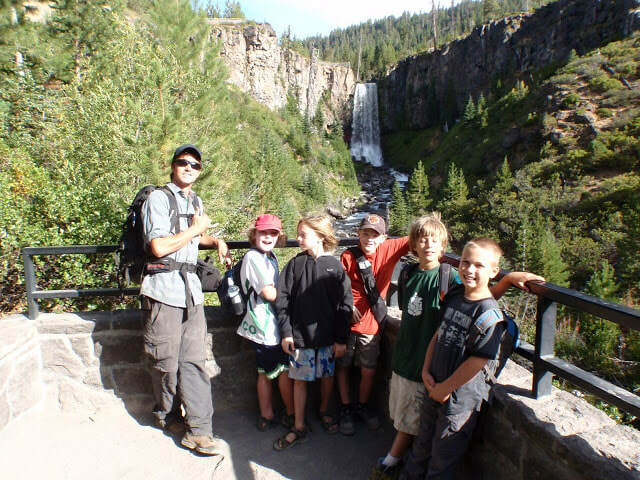 Campers start at the Fall River Fish Hatchery and adventure to Fall River Falls to play in the grass and the stream below the falls. Fir Lake - An easy 1-mile hike passes Pika Lake and ends at the much prettier, and way more fun, Fir Lake. 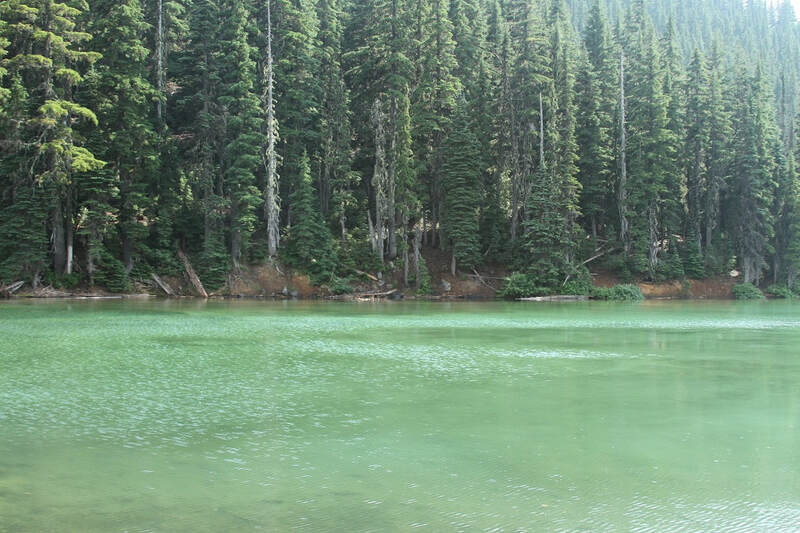 This relatively unvisited lake has excellent swimming and wide open forests to roam. Kids love it here as the exploration and fun never ends! Fish Lake - A 3000-year-old lava flow dam created Fish Lake; however, it is leaky! Therefore, in early summer there is a lake, but it quickly becomes a large open meadow as the summer progresses. This means a unique experience every time we get there! 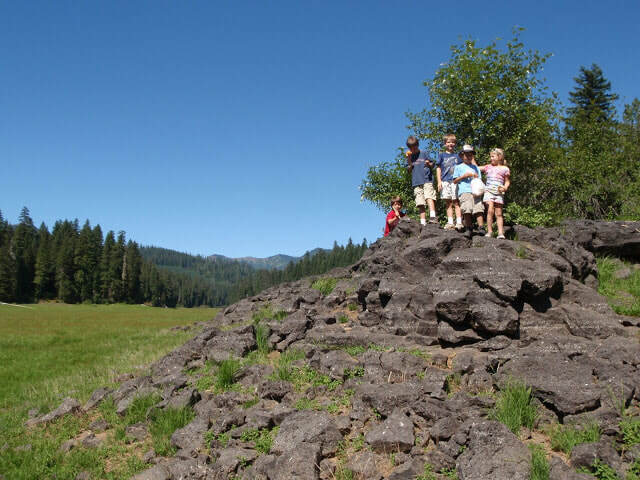 As a bonus, kids also get to explore the historic Santiam Wagon Road., complete with cabins, stables and a lava roadway! R.A.D.! Fort Rock - One of the most unique rock formations in Central Oregon. There are many routes to explore and rocks on which to scramble around. Views extend forever across this ancient lake bed with lizards, birds, and wild flowers in abundance. Don't forget sunscreen and water for this high desert phenomena! Hackleman Creek - A pristine, high mountain creek with cool water creates a unique ecosystem for a variety of wild plants and animals. 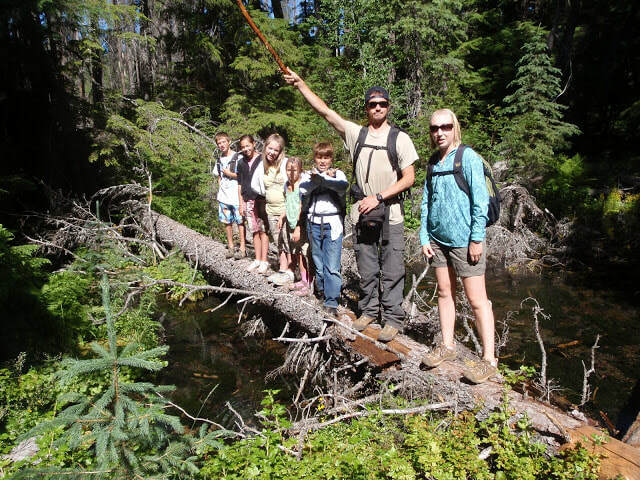 Combine walking and exploring up the shallow creek with an easy 1-mile hike through a massive grove of fir trees, and you have a complete day of fun and adventure! Hand Lake - A small drive in lake that has warm water and an excellent swimming log! 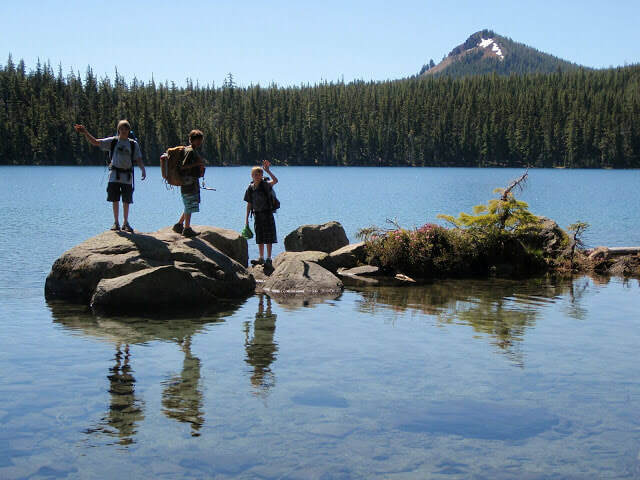 This rarely visited lake offers an incredible place for kids to play all day. This is NOT the highly visited Hand Lake along Highway 242! Once again, R.A.D. 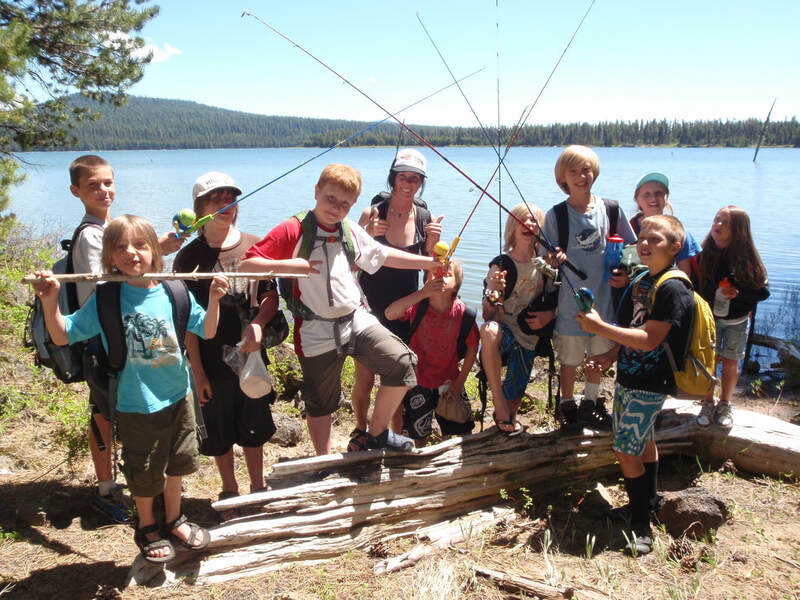 Camps gets your kids out exploring amazing, out of the way places in the Central Cascades! Hills Creek Reservoir - Description coming soon! Island Lake - This unique lake, which we can drive right up to, offers an island in its middle a burned forest all around the rim. Go straight from the van to fun! 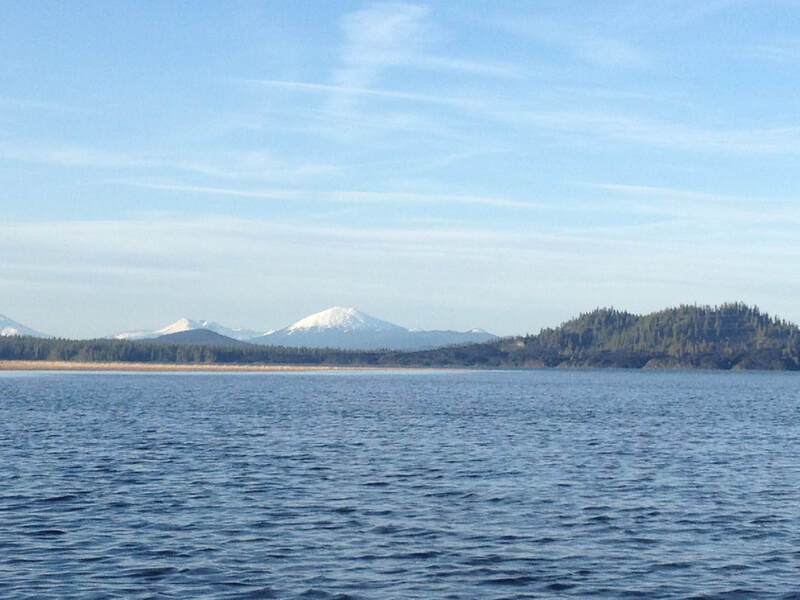 Warm water, islands, mountain views, huckleberries, fish, and good times! What more could a kid want? Jack Creek - The day starts at the headwaters of Jack Creek, which emerges from beneath a tree! Start exploring this cool area and you will discover numerous other springs coming right out from under the dry forest! This maze of water eventually forms one stream. 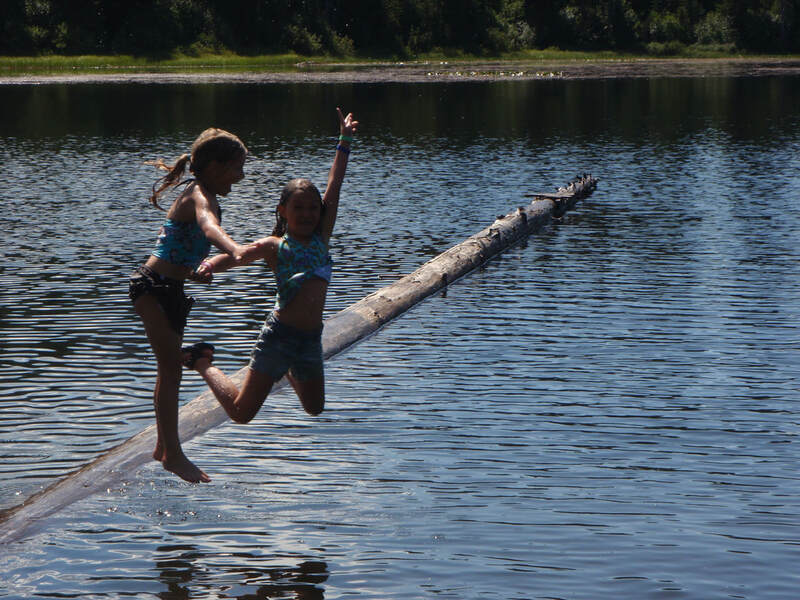 Kids love playing games and testing their balance on all the downed logs in the area! Jack Lake - A really neat little lake situated at a primitive campground with an abundance of logs, rocks and great swimming. 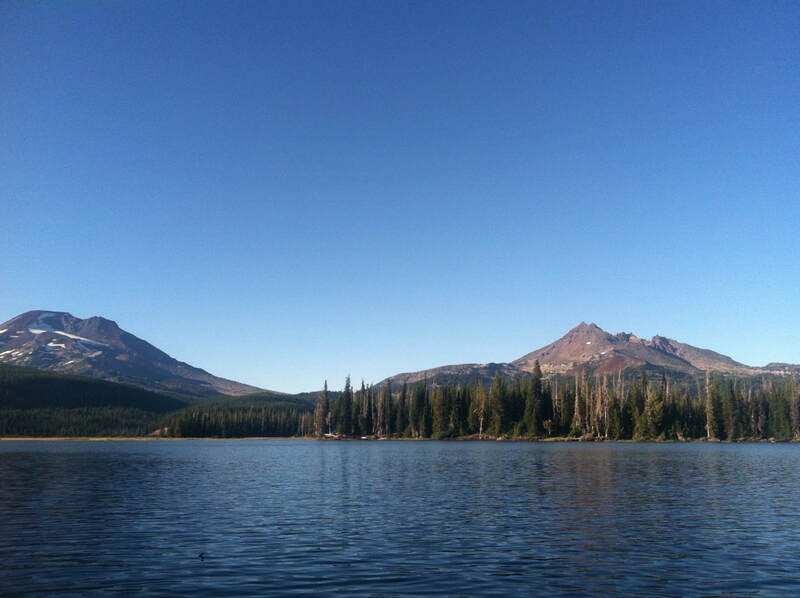 This lake is near 3 Fingered Jack and is in a forest that was burned by a large fire in 2003. Kids love to play games near the lake and enjoy a day of basking in the sun. So much fun here! Lava Lakes - (not Lava Lake) These side by side lakes are popular with local fisherman, and anybody else who loves big lakes with even bigger views! Some kids tend to play games all day near the lake while others catch crawdads, frogs, and fish. A little something for everybody in the group. There is an old fort on the east side of the lake that kids love to go check out as well! 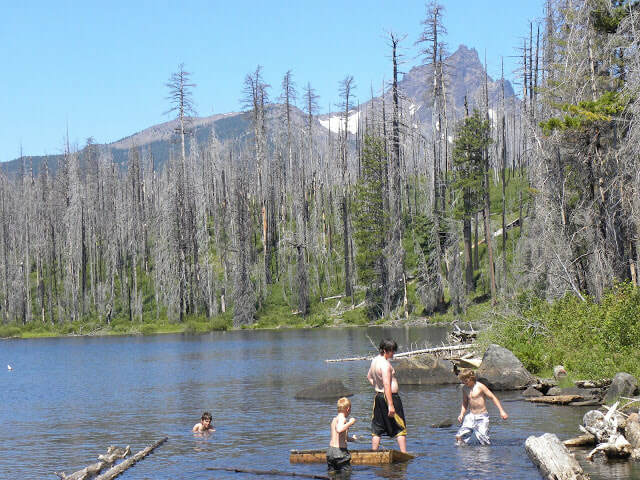 Link Lake - A small high mountain lake with great swimming and playing, all within a large grove of trees that somehow didn’t burn years ago when fires swept through. The warm waters make this place a real hit among the kids! This lake also features a cool peninsula that's great for exploring! Little Cultus Lake - A drive in location on the southern side of Cultus Mountain that offers endless exploration. You can even find some hidden sandy beaches at this awesome lake! The water is nice, the sand sculptures fun, and the surrounding forest perfect for games. A R.A.D. Camps trifecta! Little Three Creeks Lake - An easy hike to a stunning high mountain lake. Tam McArthur Rim majestically rises in the background of the lake, where snow can linger into the early summer months. Endless opportunities for a fun-filled day at this picturesque lake! Maude Creek - A tiny creek in Western Oregon that trickles through an old fir and hemlock forest. This place has numerous types of beautiful plant and animal species to discover. Creeks are always fun to explore and let your imagination run wild! 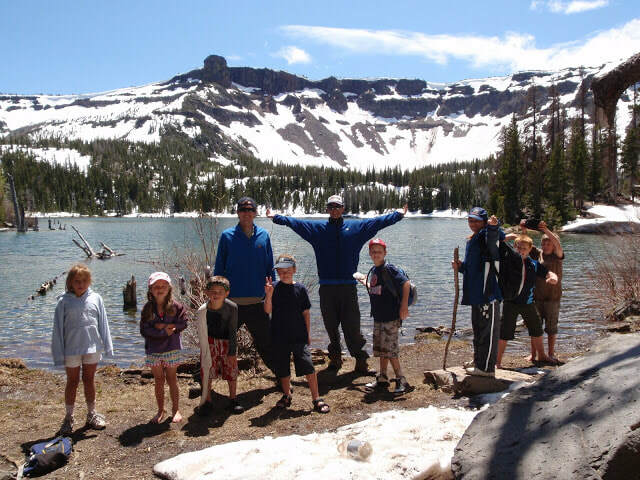 Meadow Lake - A truly special high mountain lake with stunning views of Mt. Washington that inspire kids’ imaginations. This lake is near a spot where there was once a big rockslide, which is a great place to explore. Temperate waters make for good swimming. Once again, the perfect place for kids to get R.A.D.! Mt. Bachelor - A short hike below sunrise lift at Mt. Bachelor offers a summer walk through a seasonal creek drainage (more commonly known in the winter as Dilly Dally Alley). This adventurous day gives kids a different perspective of the popular winter resort and all the jumps they love when skiing and snowboarding. Sometimes the day turns into a treasure hunt for anything a skier or snowboarder might drop. 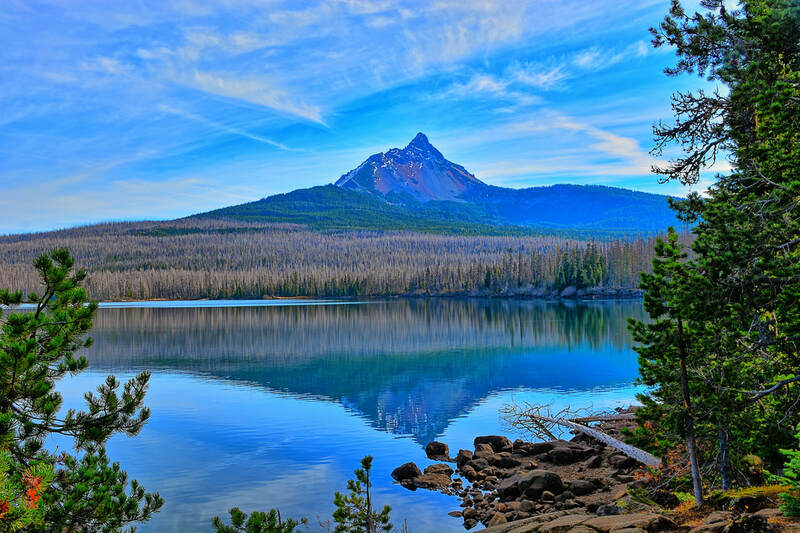 Newberry Caldera - A drive to the top of Paulina Peak offers exploration of an almost 8,000 foot peak with some of the best views around ,as well as cool rock pinnacles to explore. If the day is clear, you can see all the Cascade peaks from Mt. Shasta in California all the way up to Mt. Adams in Washington! What better place than here to learn all of the Oregon mountains! 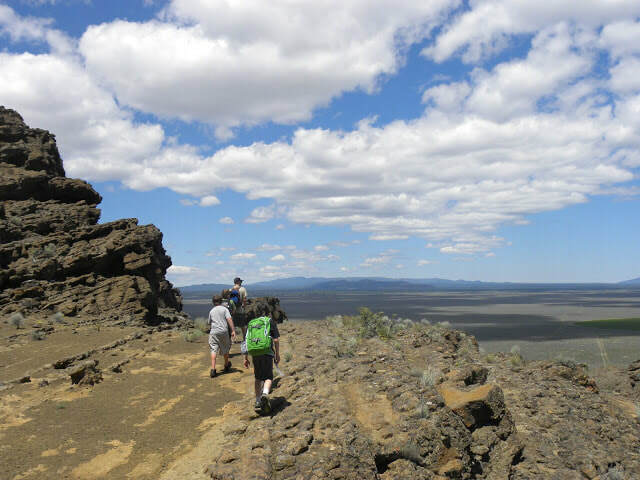 After being mesmerized by the views, you can look down upon a natural glass obsidian flow as well as the two large lakes, and try to sight the swimming area and hot springs we are headed to next! R.A.D. Day here! Parish Lake - One of R.A.D. 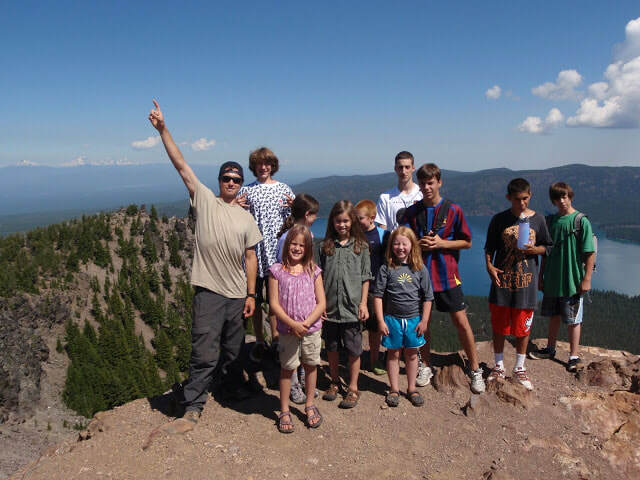 Camps' co-founder Adam's favorite lakes, which has quickly become a kids' favorite too! A short downhill hike past rhododendrons leads the campers to a diverse ecosystem, warm water, logs to jump off of, and much more. All on the side of a mountain with a beautiful meadow at one end. Picture perfect awesomeness! Parks Creek - A tiny little stream with a few deep pools to swim in. Perfect for a hot summer day with new friends. Cool water and brushy banks! The kids love playing and exploring places like this. Paulina Creek - Another R.A.D. Camps all time favorite! A two mile hike that leads to some of the most fun natural waterslides in Oregon! Awesome! Kids absolutely love slipping and sliding on these natural slides for a better part of the day. At the end of the day, the kids enjoy swimming at the base of a small waterfall. Seriously, who doesn’t like a day like this? 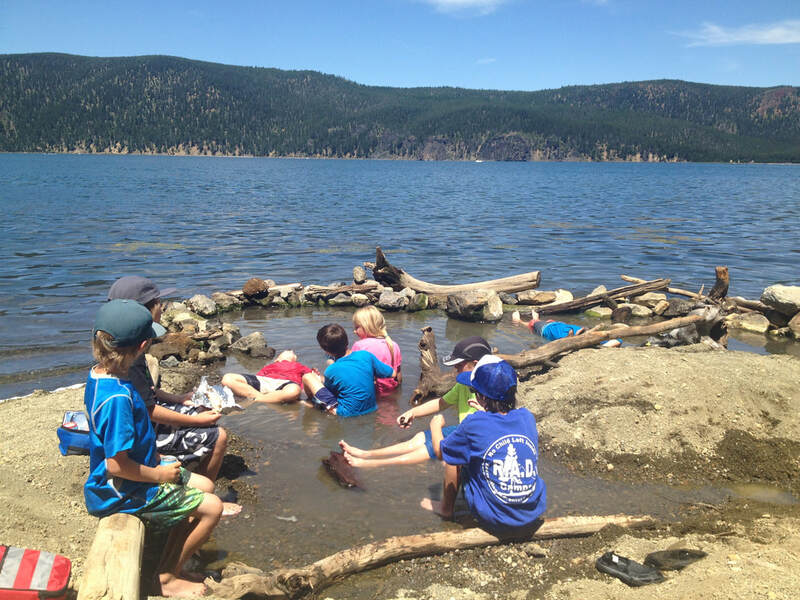 Paulina Lake - A 1-mile shoreline hike to a hot spring and a neighboring forest create the perfect environment for kids to play. This day combines excitement and relaxation at the same time. All with massive Paulina Peak in the background. 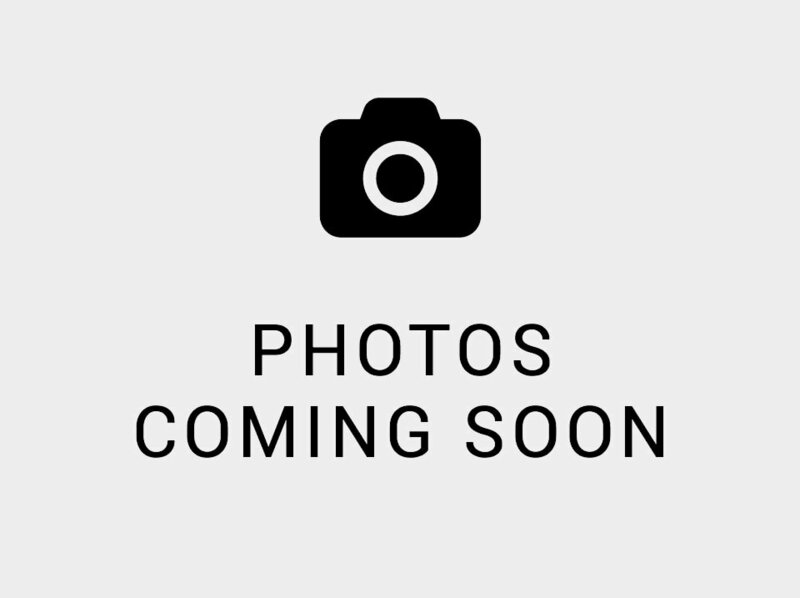 Kids explore, swim, fish, relax, and play games. All. Day. Long. Sounds R.A.D. Riggs Lake - Hopping on a giant, downed tree allows you to walk right down to this small, semi-hidden lake. 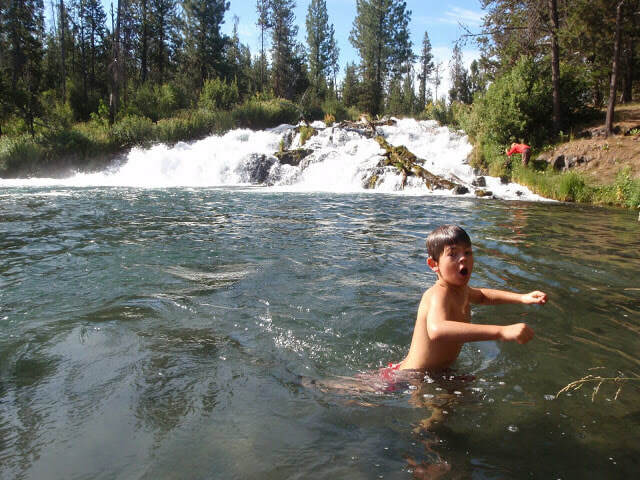 This is a great swimming location and allows the kids a fun filled day where they can enjoy the wonders of the Central Cascades. Round Lake - A drive in location with super fun swimming, a wooden raft you can find, fishing, games, and exploring. This lake even has a warm, black sand bottom that is easy on the feet. Surrounded by burnt forest, the sun can really heat this lake up to very swimmable water! With 3 Fingered Jack in the background, this lake can give you sense of being deep in the mountains, even though the van is parked right there! Sahalie/Koosah Falls - These two similar 80ft. 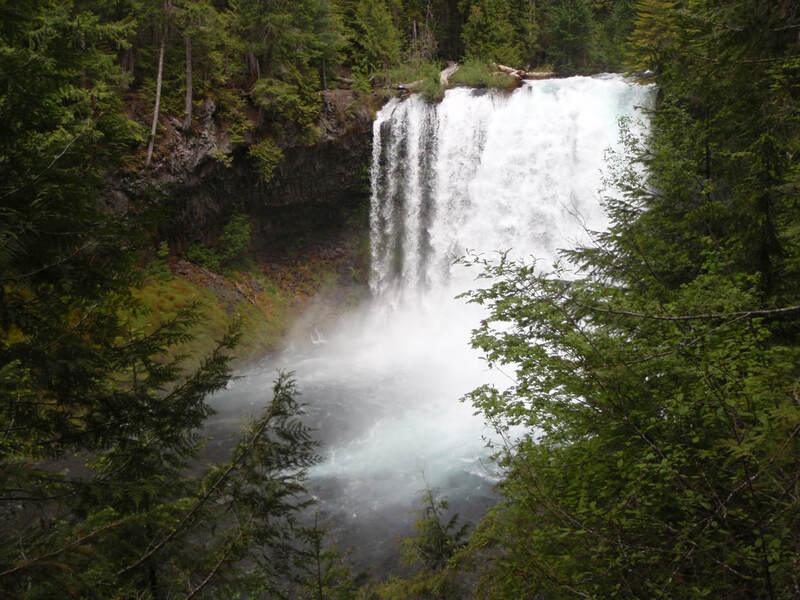 waterfalls highlight the McKenzie River as it cascades through a pristine high mountain landscape. A spectacular trail meanders along the shoreline among an old growth forest and down to Carmen Reservoir below. Perfect place for a day of forest fun and games! Salt Creek Falls - Breathtaking views of Oregon's second tallest waterfall! Tranquil Salt Creek creates a thunderous noise filled with powerful energy as it cascades 286 feet over basalt cliffs! Awesome! Surreal! Eye-popping! Get it? 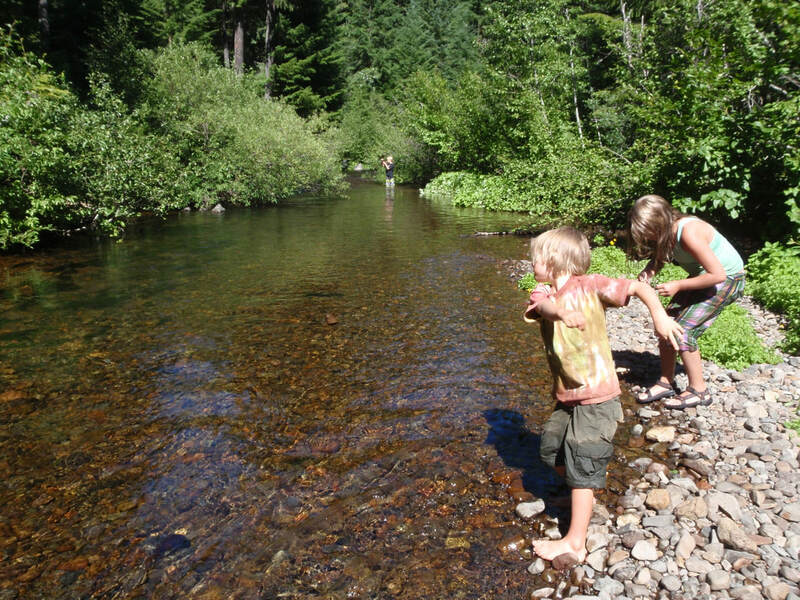 This place is great and kids can wade in the frigid water, fish for tiny rainbow trout, and play games in the forest. If that isn’t enough and they have the energy, a spectacular hike takes us to another 100 foot waterfall! Wow what a day! 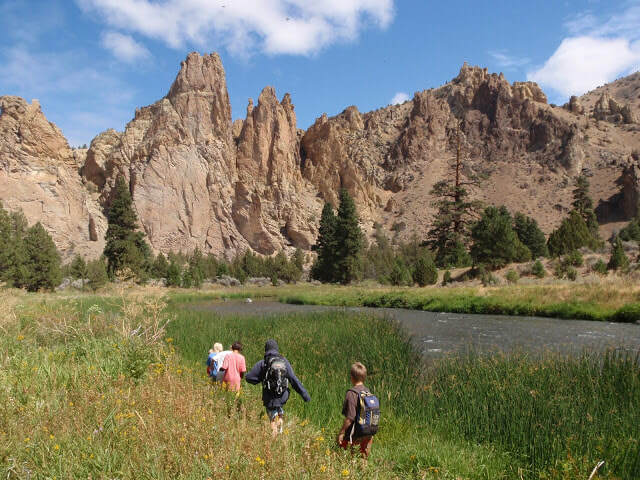 Smith Rock - With a lifetime of places to explore among the sheer cliffs rising before you, this popular State Park offers some of the most scenic terrain in Oregon. 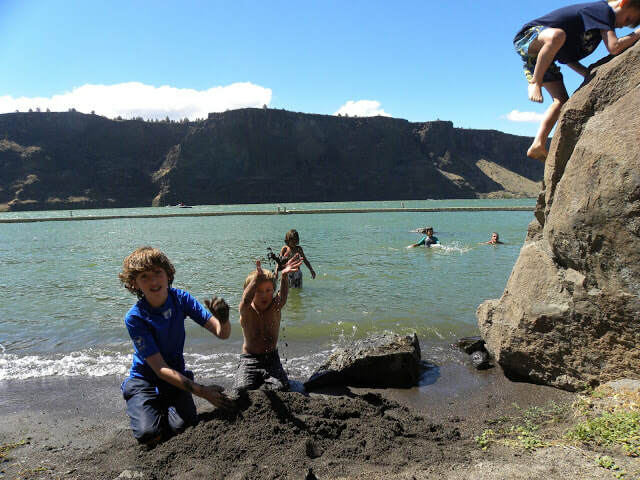 Yet, after some running around at the base of cliffs and trying to spot climbers on the high walls, the kids generally enjoy swimming next to enormous rocks on the edge of the Crooked River, sometimes in the presence of curious otters! Sparks Lake - A natural lava dam blocked some creeks to create this shallow and extremely breathtaking mountain lake. Kids like to explore a rocky knife ridge island just off shore. However, this shallow lake offers plenty of hidden places to check out and find the perfect swimming spot. Who knows where the day will lead us at this opportunistic lake! Super Secret Swimming Spot #1 - A R.A.D. Camps favorite since day 1! Kids absolutely love this place with its warm, swimmable water, rainbow trout, red spotted garter snakes, and many other native species that abound. The fun never ends at this easy to get to, but super secret place! You can keep guessing the location, but your kids will have to try to remember directions here because we’re not telling! Super Secret Swimming Spot #2 - As with all the “SSSS”s, this is a R.A.D. Camps favorite. Kids absolutely love this place with its warm, swimmable water, rainbow trout, red spotted garter snakes, and many other native species that abound. The fun never ends at this easy to get to, but secret place! You can keep guessing the location, but your kids will have to try to remember directions here because we’re not telling this one either! Super Secret Swimming Spot #3 - You guessed it! This is a R.A.D. Camps favorite. As with the previous 2 "SSSS"s, kids absolutely love this place with its warm, swimmable water, rainbow trout, red spotted garter snakes, and many other native species that abound. The fun never ends at this easy to get to, but secret place! Did we mention all three are different locations? All secrets! Tamolitch Falls - One of the prettiest places in all of Oregon! Known locally as The Blue Pool, this is another geologic oddity unique to Oregon. A mostly easy, two-mile hike through a fantastic old-growth forest gets the group to a phantom waterfall within the McKenzie River. Why phantom waterfall? Because the roaring McKenzie river actually disappears underground for a while. The Blue Pool is where it resurfaces and continues its flow westward. Cool! 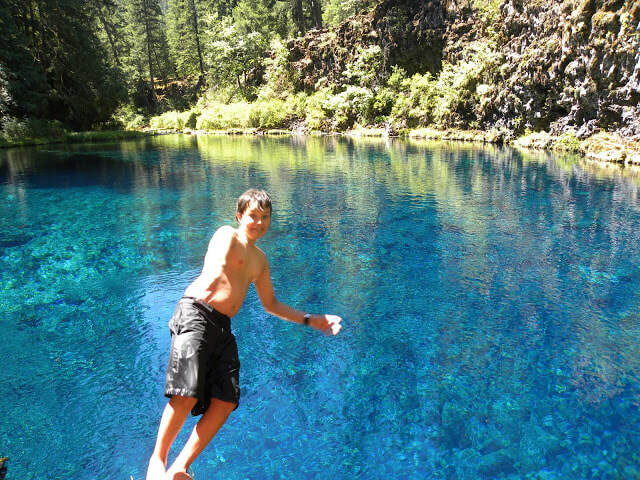 Kids love to test their bravery and swim in the crystalline turquoise water, although the water is just 42 degrees Fahrenheit! Brrr. Not up for the cold water? No worries, there are plenty of cool areas to explore and games to play once here! Including at the dry river bed that makes the “phantom” waterfall! 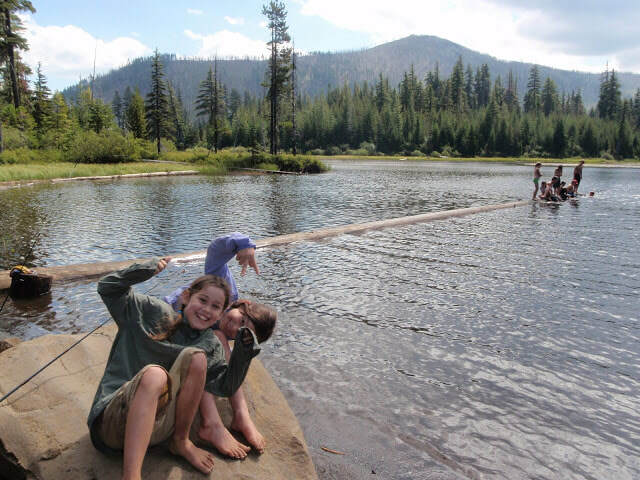 Todd Lake - A family favorite for anybody who has ever been to Bend, and for good reason! Yet with R.A.D. Camps, we leave the crowds behind and the kids usually explore up to the much lesser known, Bare Lake. 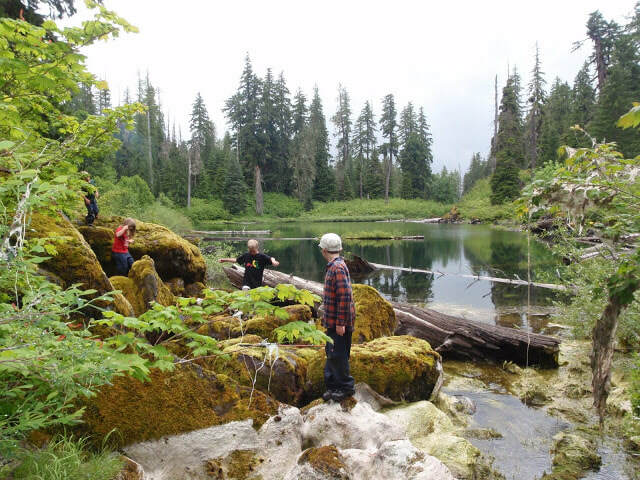 This is where we can play around in the lake or on the butte next to it, maybe even walking the ridge line, all the while exploring an old growth Mountain Hemlock forest with spectacular views of Mt. Bachelor and Broken Top! Torso Lake - This is another rarely visited, yet really cool lake that offers a premier place for kids to play. The lake is tucked in close to Mt. Washington and has great swimming with plenty of room for games and fun. 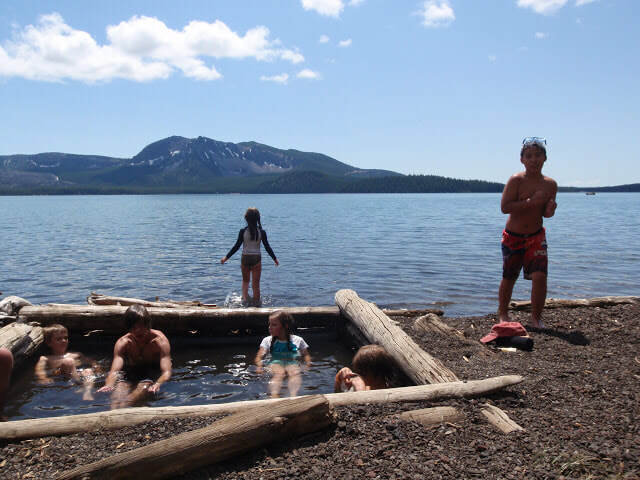 Ever wonder where else in the country, besides Central Oregon, has so many mountain lakes that are perfect for kids? Get R.A.D.!! Tumalo Creek - Close to town, yet far enough away for a R.A.D. 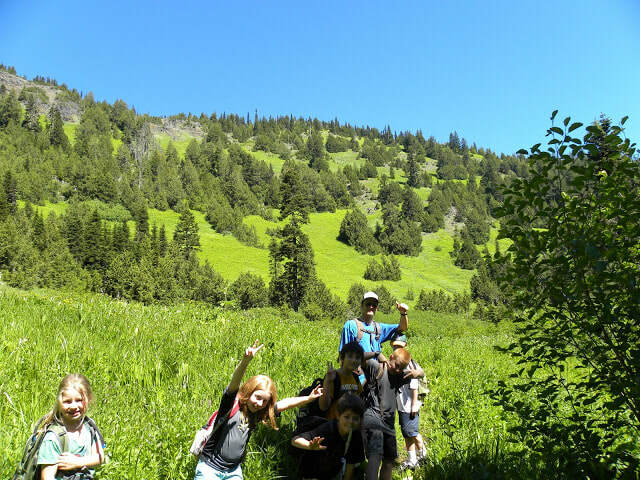 Camps adventure (we call this a "Radventure"). 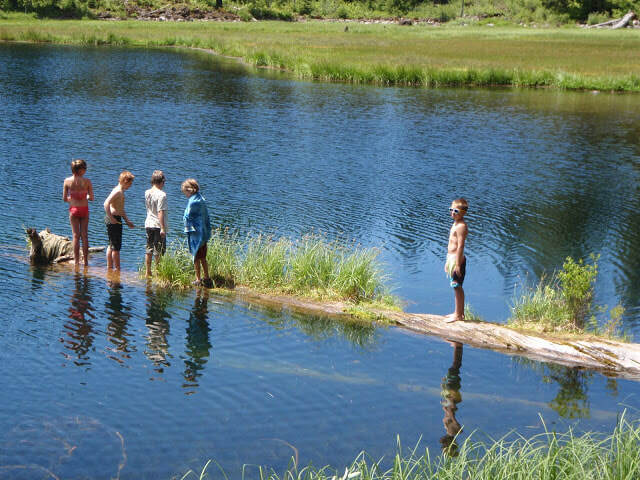 This is a great place for kids to swim in cool water and play in an alpine environment. Wildflowers, grouse berries, and Mountain Hemlock are among the many species here! 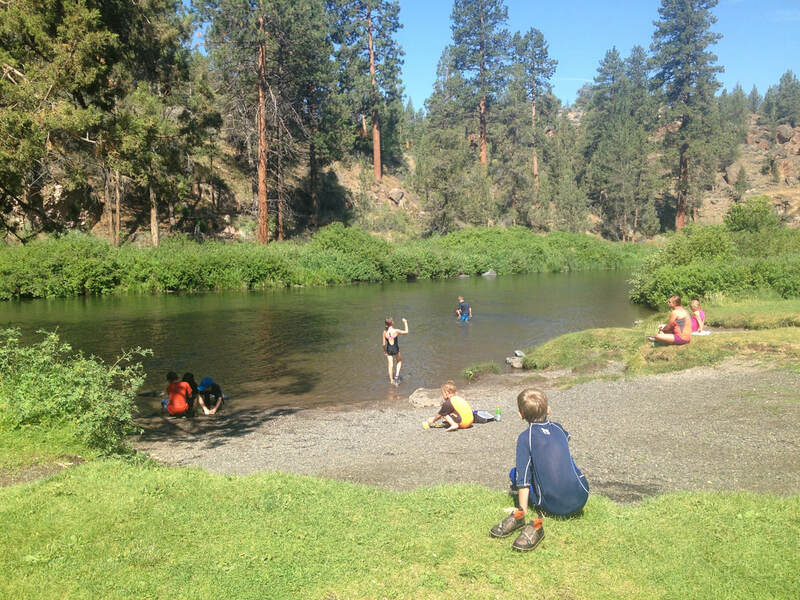 Tumalo State Park - The Deschutes River flows through a pristine area with tons of open space for kids to use their imagination and play all day. Kids love floating and bobbing their way down the mellow river and crawling through the maze of tunnels embedded within the bushes. How perfect is that for a fun day! 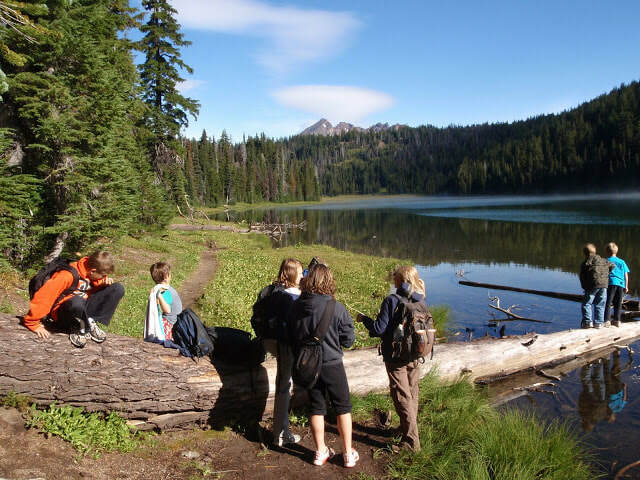 Twin Lakes - A local favorite with good camping, fishing, and exploring. Adventures abound here! R.A.D. 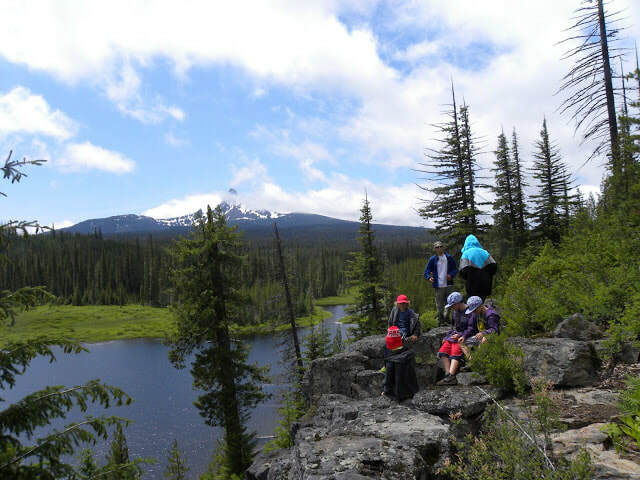 Camps takes the kids to North Twin Lake for a full day of what we do best, natural play time and outdoor freedom! Wickiup Reservoir - A massive reservoir that holds back the Deschutes River, this place has endless opportunities for freedom of exploration. 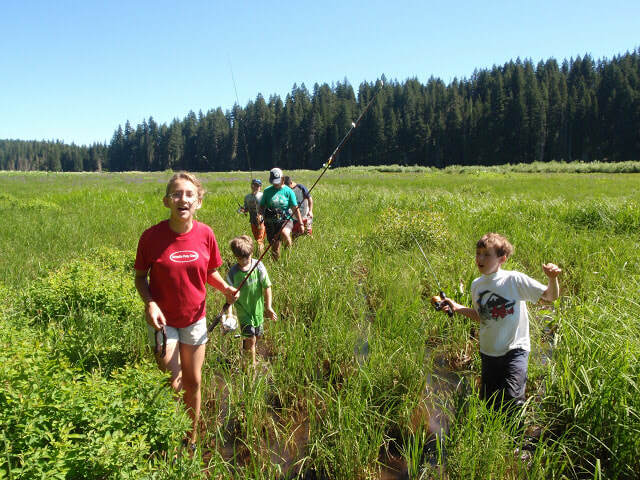 We usually seek out our own private location, where the kids can spend all day running around in the surrounding forest, taking a swim, or maybe even fishing if they bring a pole. Bald eagles can be seen here and it's also possible to watch ospreys dive into the water for fish. Cool!